That joke referred to the preident’s second swearing in ceremony and Emanuael’s notorious swearing on a daily basis. “Every week the guy takes a little time away to give back to the community. Just last week he was at a local school, teaching profanity to poor children,” according to Obama. Excerpts of Obama’s remarks were released by the White House. President Obama attened the Alfalfa Club dinner last night in Washington DC. The Alfalfa Club was started by four Southerners in Washington’s Willard Hotel in 1913. Its sole purpose was an annual night out for the boys, and it took its name from a thirsty plant that sends its roots deep down looking for liquid refreshment. There has never been an event like this in Washungton DC… And then again this is the “40 something” inauguration here; all with their own distinct character excitement, hope and glory. 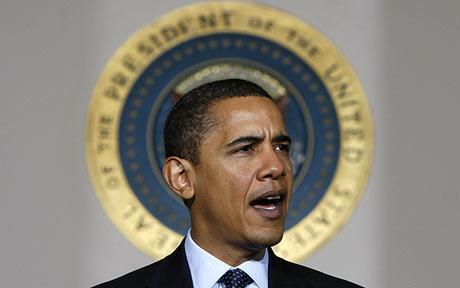 There has never been a black American President of the United States. And who can recall a President-elect appearing with the man he defeated in the polls to ask the public, all Americans, for unity, action, and responsibility? Last night, Barack Obama did just that, as John McCain joined him at a very public dinner. “I could stand here and recite the long list of John’s bipartisan accomplishments …” Obama said. McCain returned the gracious feelings at the dinner. “I am very grateful to the president-elect and to all of you for this very considerate gesture, and for allowing me to play a small role in the inauguration of the 44th president of the United States, even if it isn’t the one I had in mind a few months ago,” McCain said. 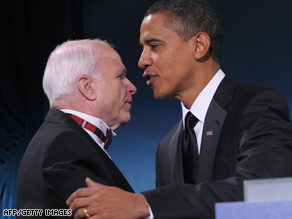 President-elect Barack Obama greets Sen. John McCain on stage after praising him at a bipartisan dinner. Barack Obama stood at the threshold of the White House on Monday, summoning fellow Americans to join him in service as tens of thousands flocked to the nation’s capital to celebrate his inauguration as the first black president. “Tomorrow we will come together as one people on the same Mall where Dr. King’s dream echoes still,” said the president-elect, invoking the memory of the Rev. Martin Luther King Jr. on the national holiday in his honor. The 47-year-old former senator takes office at noon Tuesday at a time of economic crisis at home and two wars overseas. But the challenges of the moment receded into the background for many who came for a chance to witness history. “I didn’t think I would see a black president in my generation. I just had to be here,” said Donald Butler, 20, a University of Washington student. Emergencies have always brought commensurate new authority for the presidents who faced them, not only because the public demanded action but also because rival branches of government went along. Obama arrives with a rare convergence of additional strengths, some of them inherited and some of his own making. Predicting a presidency, to be sure, is hazardous business, and much will depend on Obama’s choices and fortune. But historians, recent White House officials and senior members of the incoming team expressed broad agreement that Obama begins his term in command of an office that is at or near its historic zenith.